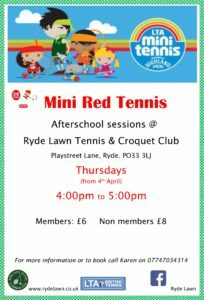 We will be running after-school Mini Red (ages 5-8) tennis sessions on Thursday afternoons 4-5pm. Cost is £6 for members or £8 for non-members. For more information or to book call Karen on 07747034314.